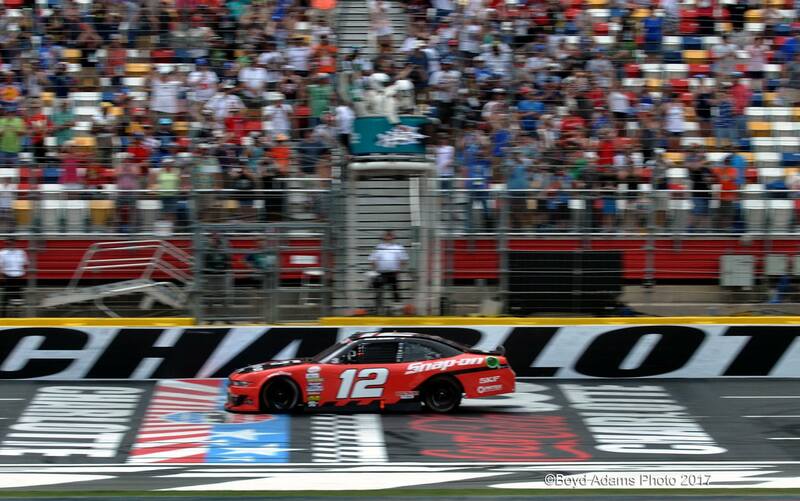 This week rubber was ground into the track and track-bite was applied to the outside grooves in hopes of creating better racing at Charlotte Motor Speedway – – Ryan Blaney didn’t care, he still showcased the bottom lane on his way to his fifth NASCAR Xfinity Series win. Sharing most of the leading responsibilities with Kevin Harvick, Blaney kept his car glued to the bottom lane throughout the afternoon. Without a doubt, Blaney was on a rail. While running up front the leaders always stayed on the bottom lane, those chasing them didn’t always follow this idea. The extra grip from the track-bite helped the high line work in quicker, creating furious battling in the center of the pack. If your car wasn’t fast on the bottom you could be faster running somewhere else. 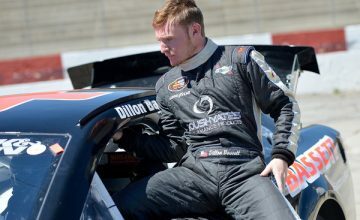 Starting the race seventh, Christopher Bell made his NASCAR Xfinity Series debut. 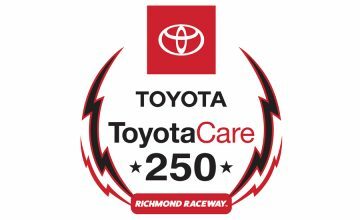 Three laps removed from the initial green flag Bell was tagged in the left rear by Ryan Reed. Spinning through the quad-oval’s grass the No. 18 didn’t occur any splitter damage, leaving him in contention albeit deep in the field. A rash of cautions slowed the race early in the first stage, this gave Bell a chance to charge through the field. By lap twenty there had been three caution periods, but the final twenty-five laps went green. Harvick won the first stage with only a handful of drivers keeping up with his pace. The races rhythm emerged in the second stage. During the longest green flag run of the race drivers began to push the limits of the track, widening the groove each lap. Harvick was especially keen on this; rim riding turns three and four, trying in vain to advance his position. The three drivers chasing Blaney in the second stage, Denny Hamlin, Austin Dillon, and Harvick never swapped positions. The last stage was the longest, 110 laps, but due to a plethora of cautions it had the same feel as last Saturday’s Monster Energy All-Star Race. 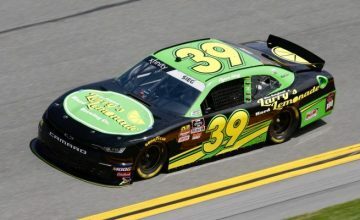 Roush Fenway Racing’s Darrell Wallace Jr. meticulously drove through the top-ten, showing his talent holds up to that of the Monster Energy NASCAR Cup Series regulars. Know as Bubba by his friends, fans, and some media members, Wallace took the lead from one of his best friends, Ryan Blaney, with 92 laps remaining. Four laps later Blaney went back around Wallace’s No. 6 Ford Mustang – later in the final stage he would suffer a hung lug nut during a pit stop, leaving him marred in traffic. With six laps to go he scrapped the wall coming off turn four, coming back to turn one he cut a tire and went for a spin. This created a caution and setup the three lap dash to the finish. Ryan Blaney claimed his fifth NASCAR Xfinity Series win on Saturday and became the first father/son duo (Dave Blaney) to win at Charlotte in the NXS. Photo by Boyd Adams. At the time Harvick held the lead, Blaney was second, Dillon was third, and Brad Keselowski. 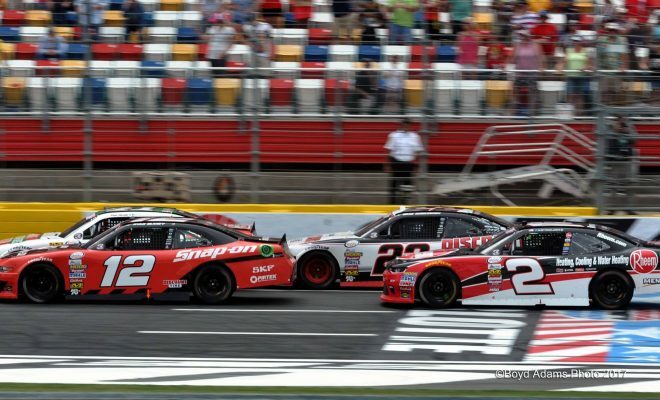 If Harvick chose the bottom lane he’d hand Blaney a free push from teammate Keselowski, if he went to the bottom he knew Austin Dillon wouldn’t help. In the end he elected to split up the Team Penske drivers. Blaney and Harvick dueled through the first and second turns, on the outside Harvick had a head of steam. It seemed all but certain he’d clear the young driver down the back, but Blaney held fast. Dumping air into the left rear wheel-well and onto the splitter, Blaney stalled Harvicks momentum before clearing him for the lead in turn three. With aero-push the way it is that was the end of the story for the 300 mile NXS race. “The top would get going,” said Harvick but it took “fifteen-twenty laps.” Even with that said “there [were] definitely options” out there.